Cute and unique laser charm will be a favorite for couples to share with each other, especially on Valentine's Day. 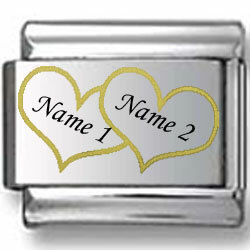 Charm features a pair of brilliant gold hearts with the ability to add two names inside those hearts. Engravings are laser etched so they are permanently inscribed into the stainless steel base link.